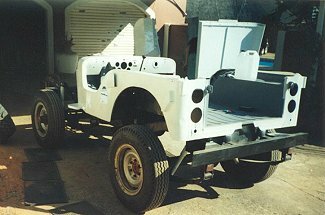 Willie Bester writes: "This is my 1946 CJ2A s/n 71170 rebuild int he Republic of South Africa. I bought the Willys body and chassis from a guy who stored it in his store for about 20 years. It was actually in good condition and had its original (Pasture Green) colour. "I started rebuilding in February 2002, starting from scratch. 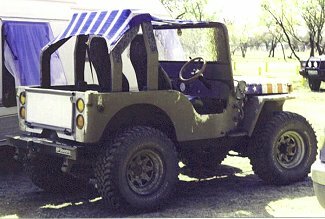 I used the Willys body and chassis, and I bought a Toyota FJ40 to use as a donor vehicle. 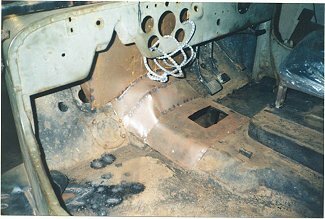 I used everything from the FJ40 (differentials, gearbox, transfer case, complete steering). I used an I6 2.8 litre Nissan motor (L-28) for the powerplant and it is working perfectly. I fitted a set of 33-inch BFGs and painted it like the American flag. "I had to extend the chassis about 100mm to get everything to fit the way I wanted it. Well after six months' of hard work and dedication I started it and attended my first 4X4 meeting with it. I didn't break down. Not bad for a first-timer (I think)!"